designed & built covered race-car trailer. Pitstop Furniture will be offering the ‘discerning petrol-head’ their racecar-inspired furniture, which looks fantastic! New products (arena, landscape, viticulture) We have final trials taking place now for our Arena/Landscape harrow. The Lyndon designed product will offer ease of use and greatly improved flexibility for differing surfaces that it is designed for including sand, clay & soil surfaces. We will send out a brochure with prices and reseller discount details in the near future. We also have under development an aerator for the viticulture industry. This aerator will be used between the vines to enhance root strength, and be optioned with a liquid fertilizer delivery system that penetrates through the top pasture layer. Our team will finish up the new harrow product videos this quarter. These will be available on-line and we hope they will further enhance end-user knowledge to assist our dealers in more sales for their businesses across the country. We have one more 14ft wide folding hydraulic frame in stock, which is ready to fit out and paint. This folding frame is controlled by a manual hydraulic pump, so can be towed behind a work truck and comes with LED lights. It can be fitted with the clients choice of harrows. (typically combo or drill harrows). This towable folding frame retails for $12,275 + gst (plus harrows). We can also fit this frame with a tractor ready hydraulic and hitching system, and paint in the colour of your choice. Special dealer only price is available (excluding harrows). 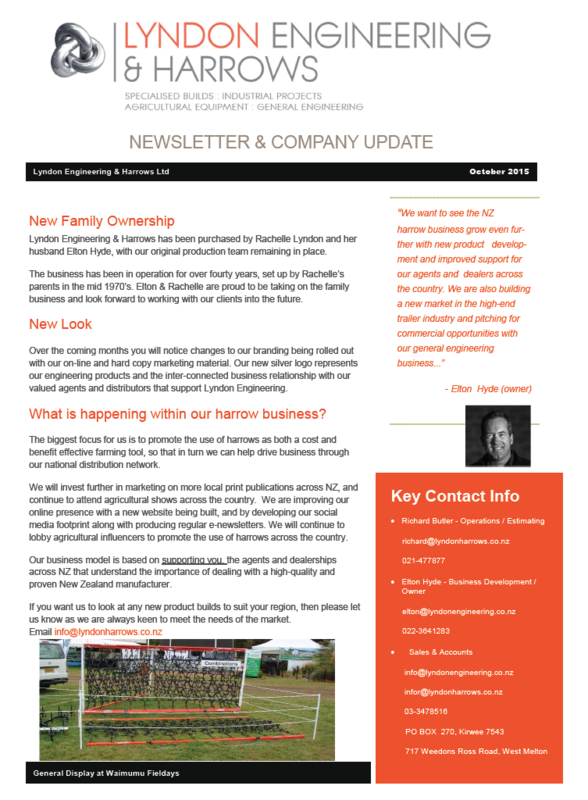 Lyndon Engineering & Harrows has been purchased by Rachelle Lyndon and her husband Elton Hyde, with our original production team remaining in place. The business has been in operation for over fourty years, set up by Rachelle’s parents in the mid 1970’s. Elton & Rachelle are proud to be taking on the family business and look forward to working with our clients into the future. Over the coming months you will notice changes to our branding being rolled out with our on-line and hard copy marketing material. Our new silver logo represents our engineering products and the inter-connected business relationship with our valued agents and distributors that support Lyndon Engineering. What is happening within our harrow business? 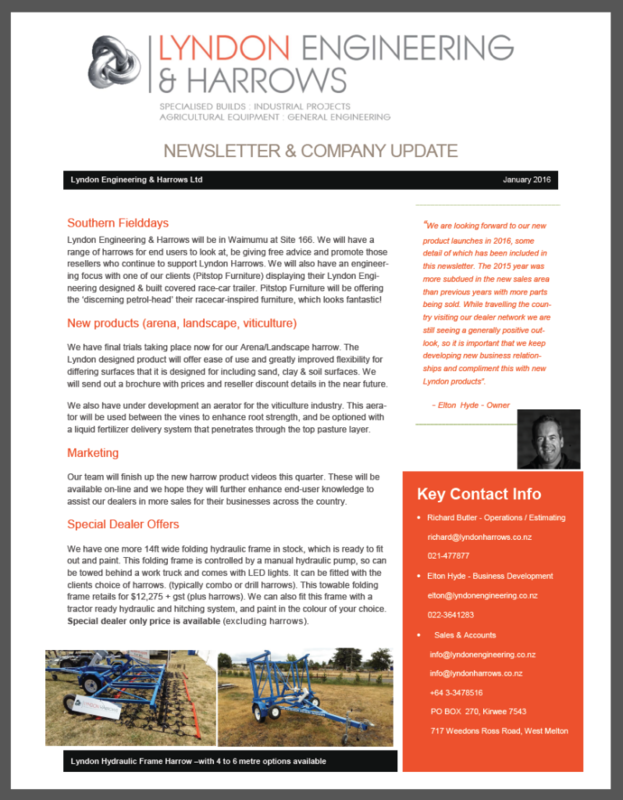 The biggest focus for us is to promote the use of harrows as both a cost and benefit effective farming tool, so that in turn we can help drive business through our national distribution network. We will invest further in marketing on more local print publications across NZ, and continue to attend agricultural shows across the country. We are improving our online presence with a new website being built, and by developing our social media footprint along with producing regular e-newsletters. We will continue to lobby agricultural influencers to promote the use of harrows across the country. Our business model is based on supporting you, the agents and dealerships across NZ that understand the importance of dealing with a high-quality and proven New Zealand manufacturer.